Earlier this week, Ben & Jerry’s secretly added two new vegan flavors to their vegan line, increasing the number of their dairy-free options to six. There is still no word about it on their website, and ice cream lovers everywhere discovered the news as a result of vegans posting their discovery of the Cherry Garcia and Coconut Seven Layer Bar on social media. 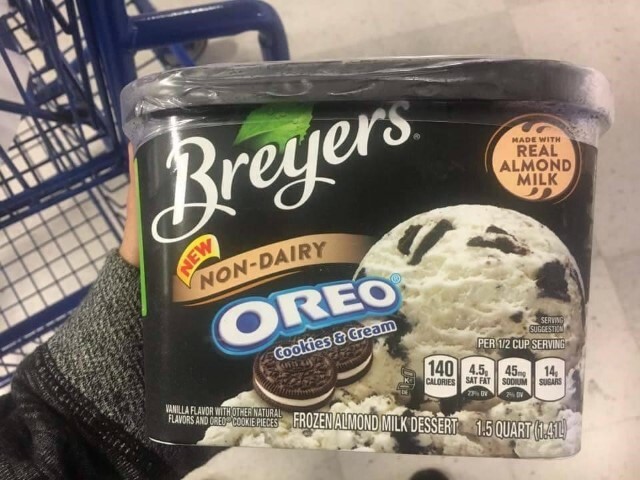 Now Breyers, another well known and popular ice cream brand, secretly released a non-dairy almond-milk based Oreo Cookies & Cream frozen dessert, announced via The Hopeful Herbivore’s Facebook page. Just as is the case with Ben & Jerry’s, there is no word about this flavor on the Breyers website, and the closest I got to finding it led me to their (non-vegan) lactose-free section, which includes two flavors: chocolate and vanilla. According to the post, the Cookies & Cream flavor was most likely found at a “Meijer located in the Chicago area.” While some people, including myself, have considered the option of the photo being fake, since Ben & Jerry’s new vegan options are also not included on their website yet, perhaps a cautiously optimistic mindset is best until we find out more, and it may just be the case that it is a limited edition flavor, testing out customer demand. It’s real. I’m eating it now.